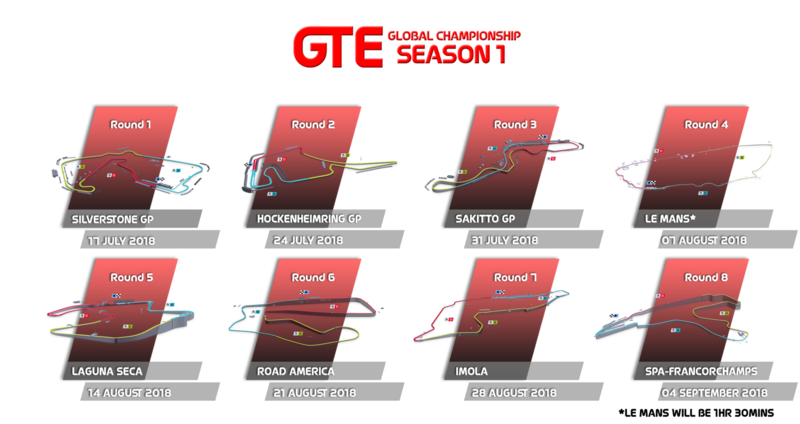 Welcome to the inaugural GTE Global Championship!! Please Complete the seeding run so we can work out what Division you will be placed in. If it is not done we will place you in the division we think is best for you. 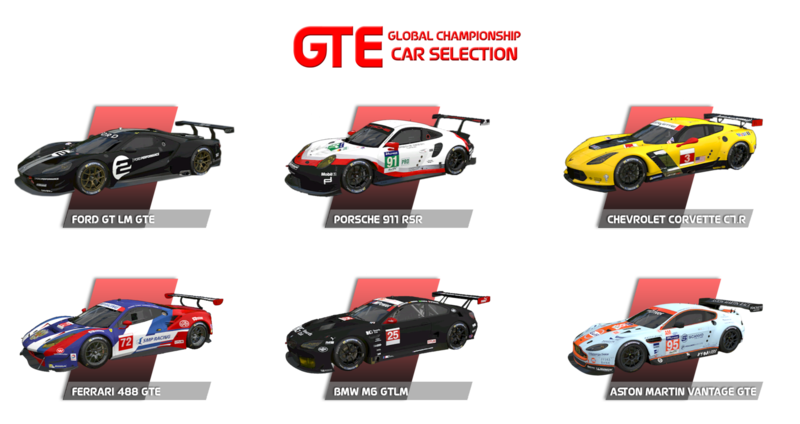 ALL GTE CARS WILL BE AVAILABLE FOR SELECTION but there will be a cap on how many people can pick a certain car to hopefully make variety. Car cap is 4 per division on a first come first served basis. So get the car you want quick. If you pick a car and don't turn up to to the first two races your car will be given back to be chosen again. Car swaps mid season can be made but must be discussed with an admin prior to changing. Lobbys will start at 8:00pm BST on Tuesdays on the calendar. Please be on before the time at 7:45 so we can sort the lobbies quicker and allow for any delays from disconnections. Please note: If there are repeated disconnections from the same drivers we will be forced to start without you. The qualifying session will be 15 minutes long. The races will start from the grid based on the qualifying session. The Assists for the championship will be set to REAL which means all the assists will be realistic to real life. in Division 1 it will be forced cockpit and no driving line but for Division 2 and any others it isn't permitted to run cockpit. One for fastest qualifier and the other for fastest lap in the race. Points after the positions shown will not receive any points. Points are only awarded after 80% is complete so if you lag out before then you wont receive any points. Teams can be up to a maximum of 2 drivers. Teammates don't have to run the same car. The team championship will run through all the Divisions to make the team championship more competitive. If you don't pick a team mate we will pick one for you to make the team championship again more competitive. There will be no drop rounds in this series so if you can't make a race just let us know in that race thread. Setups are allowed in this championship. Report incidents and/or corner cutting or overly defensive swerving/blocking immediately after the race to the admins. 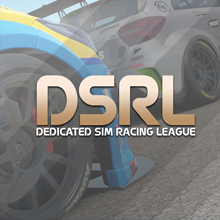 Admins will review all evidence submitted in due course and any penalties will be applied before the next race. Any driver who loses connection to the lobby during qualifying (If they are yet to set a time) will start the session from the back of the grid. Please copy the format below in order to register for the GTE Global Championship. Have you posted your seeding run?